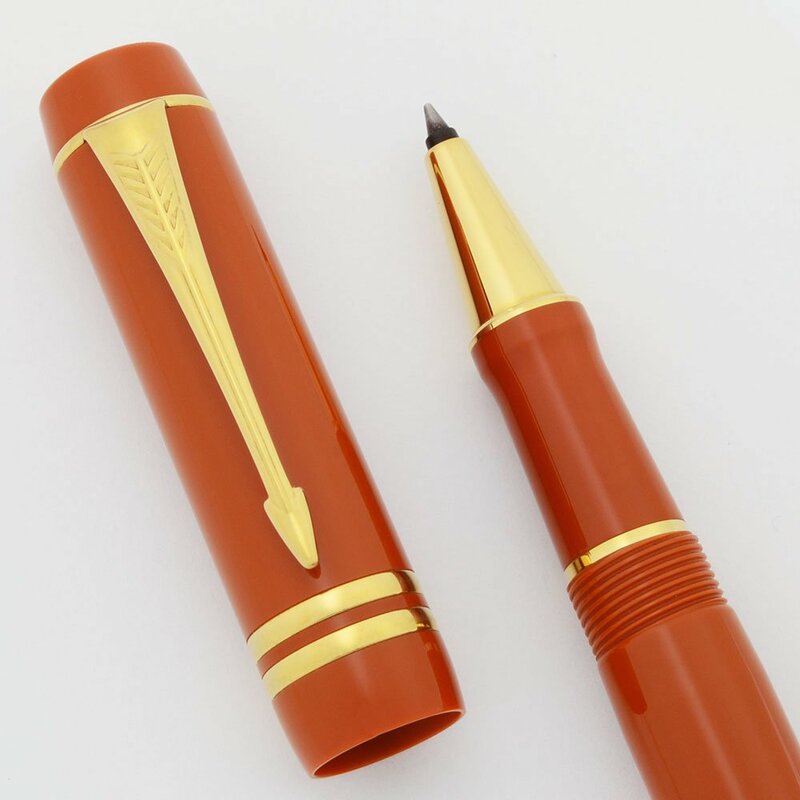 Modern Parker Duofold rollerball pen from the later 1990's, designed after the classic 1920s pen. Orange with gold plated trim. Excellent + condition, in original box with paperwork, with a refill included. Type High end rollerball pen. Product Name Duofold Mk III -- this is a modern remake of the classic Duofold pen. 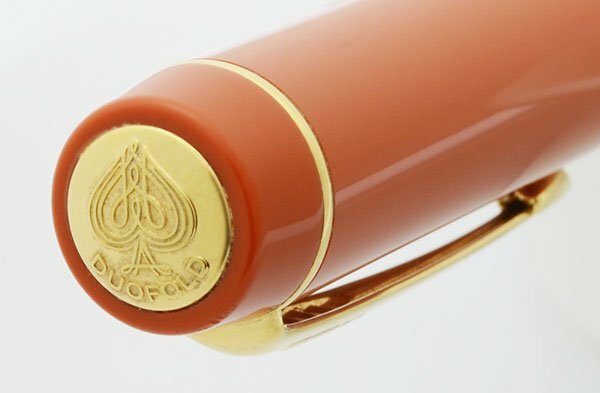 Manufacturer and Year Parker, France, circa 2005 (There is a IT date code marked on the end of the barrel, which we normally interpret as meaning 1995, however this pen has the "Ace of Spades" emblem on the top of the cap which didn't come out until 2005. We are guessing Parker probably re-used the date codes.). 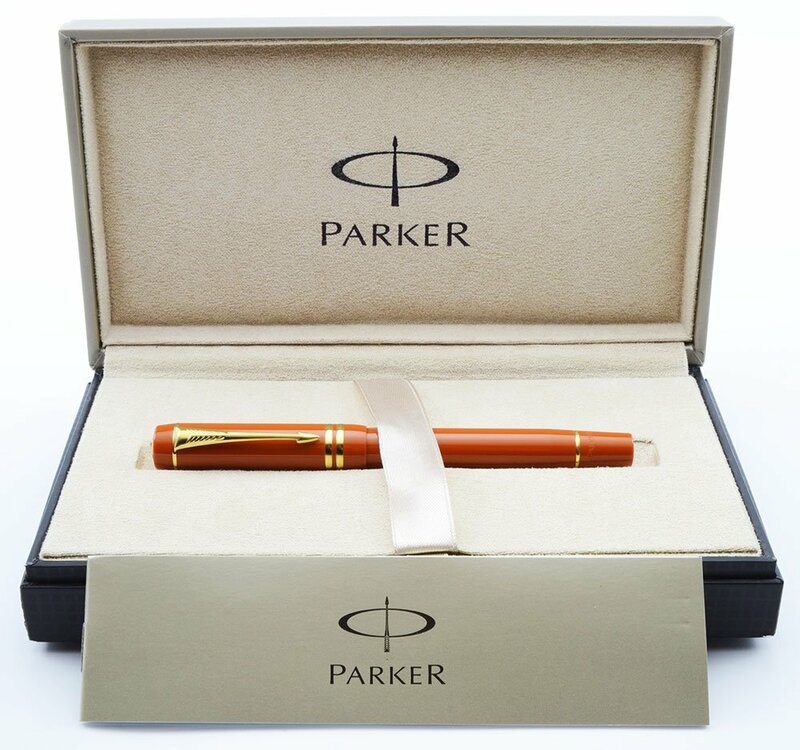 Filling System Takes Parker rollerball refills. A working refill will be included. Color Orange with gold plated trim and a double cap band. There is a gold Duofold "Ace of Spades" emblem on the top of the cap. Condition Excellent + condition for this very pretty pen that rests in its original Parker box that includes paperwork. There are two long thin scratches on the cap, one to the right of the top of the clip and one to the right of the bottom of the clip. The barrel has light signs of usage. The end of the pen looks great. No cracks, chips, dents, or dings. The imprints are clear.